On April 4, 1965, Swedish automaker and aerospace manufacturer Saab introduced its upcoming Saab 37 Viggen (Thunderbolt) fighter jet, the most advanced European jet fighter design until superseded by the Panavia Tornado in 1981. The futuristic looking Viggen was distinctive in its “canard” design, a sort of double delta wing layout never before used on a mass produced aircraft. The Viggen replaced the Saab 35 Draken (Dragon) as Sweden’s primary jet fighter. The Draken, introduced in 1955, had been the first fully supersonic jet fighter produced in Europe. Originally created as an airplane manufacturing company in 1937, Saab diversified into the production of automobiles in the late 1940’s. During the 1950’s Saab also got into the electronic computing business, developing early versions of computers to use with their navigation systems. The Saab developed computer systems were used in the production of the Viggen. In 1975, Saab sold its computer division to Sperry UNIVAC but retained its aircraft computer division. Saab developed a reputation for forward thinking and safe, reliable products. In 1968, they also branched out into producing heavy trucks. This is a logo for Saab Group. The 1955 introduction of the Draken jet fighter put Saab at the forefront of European jet fighter design, a powerful incentive for other countries (namely the Soviet Union) to respect Swedish neutrality. Operated by the Swedish Air Force, as well as by Finland, Austria and Denmark, 651 Drakens were built and were not retired until 2005. The Viggen was to be the modern replacement for the Draken, though only 329 Viggens were built due to increased performance and decreased necessity. Despite its impressive performance, the Viggen failed to find foreign buyers, although the United States considered the Viggen along with other competitors for the program that became the F-16. The US also blocked a potential sale of Viggens to the Indian Air Force. Thus, the Viggen would remain a uniquely Swedish aircraft. Powered by a single Volvo built turbofan engine (RM12, now GKN Aerospace), the Viggen was capable of Mach 2.1 speed (1386 mph) and had a range of 1242 nautical miles on internal fuel (2000 kilometers). Armed with a single 30 mm Oerlikon KCA cannon (150 rounds on board), the Viggen had hard points for fielding 6 missiles of various types, including heat seeking and radar guided. Other systems such as electronic warfare pods and adaptation as a 2 seat trainer were also introduced. Akan m/75 30mm for Fpl37 Viggen. Photograph by Flygvapenmuseum. While the Viggen never saw actual combat, it has the distinction of being the only interceptor jet to achieve missile lock on (via radar) with the American SR-71 Blackbird, intercepting the Mach 3 black jets as they flew past Sweden on their way to missions over the Soviet Union. Attack versions of the Viggen were also fielded, with 7 hardpoints for a variety of bombs and rockets. The 30 mm cannon employed by the Viggen had a variable rate of fire of 1350 rounds per minute, and was capable of impressive armor penetration with a projectile 50% heavier than competing 30 mm cannons at a muzzle velocity of 3400 feet per second. The Viggen was also distinguished by a design that allowed for simplified maintenance by only moderately trained ground crew, a major advantage during a conflict. The combining of easy maintenance with a robust platform while encompassing state of the art performance and technology is tricky proposition that historically bedevils airplane designers. By 1994, the Saab JAS 39 Gripen (Griffin, the corporate symbol of Saab) began to replace the Viggen as the main Swedish jet fighter, and in 2005, all but a few Viggens were retired. In 2007, the last of the Viggen electronic warfare training planes were also retired. The Viggen legacy lives on in the delta wing + canard layout of the Gripen. The Gripen has already found a home with the air forces of Hungary, the Czech Republic and South Africa, as well as Sweden. With production beginning in 1987, the Gripen is still being built, with 247 examples produced to date. Question for Students (and others): Did you know Saab made airplanes? Have you ever owned a Saab car? Every been a passenger in a Saab? Please let us know in the comments section below this article. 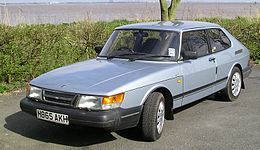 Saab 900. Photograph by David Wright. Donald, David and Jon Lake (editors). World Air Power Journal: Focus Aircraft: Saab 37 Viggen – Mainstay of Sweden’s Air Force. Aerospace Publishing, 1993. Putnikov, Mikhail. Saab 37 Viggen Walk Around. Squadron/Signal Publications, 2013. The featured image in this article, a photograph by Alan Wilson of a nice topside view of the Viggen during its display at Waddington, is licensed under the Creative Commons Attribution-Share Alike 2.0 Generic license. This image, originally posted to Flickr, was reviewed on 12 July 2013 by the administrator or reviewer File Upload Bot (Magnus Manske), who confirmed that it was available on Flickr under the stated license on that date.